Have you ever seen one of these mounds outside of your home? All of us have an immediate concern when we see these mounds near our homes. But to be honest with you, it is very easy to deal with this kind of bee pest. These bees are sometimes referred as polyester bees because after the queen builds the nest, she lines it with a decay-resistant, waterproof lining that makes the inside glossy. This allows the nest to protect the larvae that reside underground. 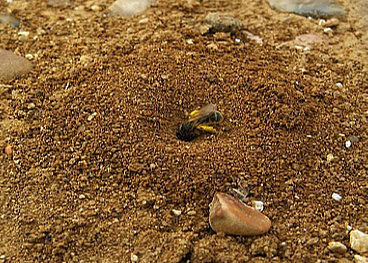 Sand bees are considered to be the highest population species of bees; however are considered to be dull, and rarely noticed by people and the wild.